Some time ago, I began cataloging a book from our backlog. 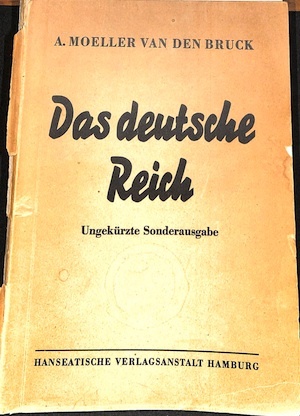 Entitled Das deutsche Reich: ungekurzte Sonderausgabe (The German Reich, unabridged special edition), it was written by Arthur Moeller van den Bruck and published in Hamburg in 1934. As always, I searched first to determine whether Hoover or Stanford already had a copy. 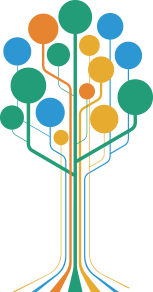 When none was forthcoming, I then searched the national bibliographical database, WorldCat, to see which other libraries have a copy. It is not listed in WorldCat. I also checked several European libraries but did not find any copies there either. Given that the author was prolific, I found this somewhat strange and began to look at the book more closely. Despite the fact that the title page states the book was published in Hamburg by the Hanseatische Verlagsanstalt in 1934, I found at the back of the book a listing of publications (including the book in hand) by a publisher in Zurich called Reso Verlag. It turns out that the text of the book I was trying to catalog was really that of Die deutsche Bartholomäusnacht (The German St. Bartholomew’s Night) by Otto Strasser, that described the “Night of the Long Knives” (June 20 to July 2, 1934), when Hitler murdered the left-wing faction of the Nazi Party (including Otto’s brother, Gregor). After Otto escaped Nazi Germany, this was one of the anti-Hitler books he authored. Because this title could not be published in Germany, it was evidently published by Reso Verlag in Zurich under a false title and subsequently brought into Germany as a book by Arthur Moeller van den Bruck, an early German nationalist admired by the Nazis. This edition also included short forewords by the publisher and by Otto Strasser; his was dedicated to the memory of his brother Gregor. This is but one fascinating example of both the anti-Nazi movement as early as 1934 and the types of rare and unique materials held by the Hoover library.